The application will enable you to export a specific Google+ feed to a Wordpress backup (eXtended RSS) file that can be later used for import. 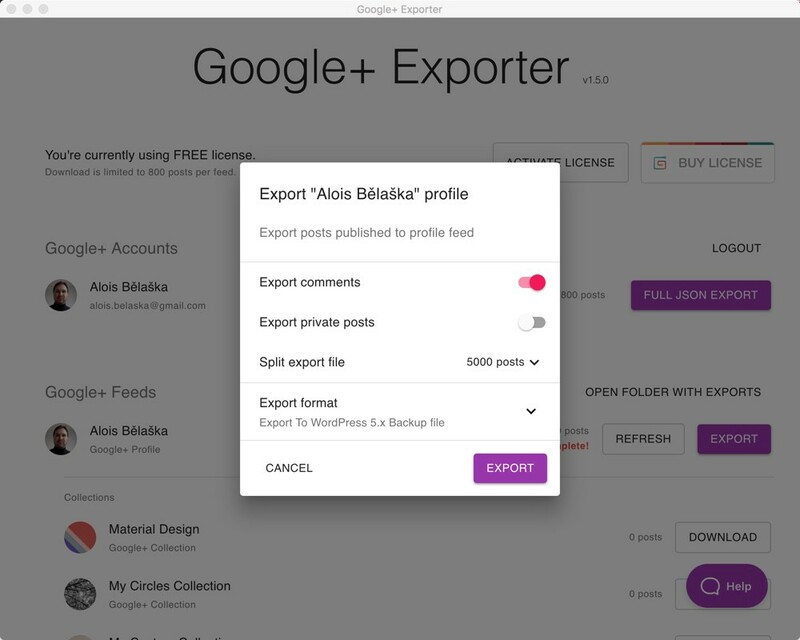 Pick a Google+ feed you’d like to export, click the Download or Refresh button to get the latest updates and then click the Export button. In the export dialog pick whether you’d like private posts and comments to be a part of the export. Export will be split into smaller files to make the import easier for you. Each file will contain 5000 posts by default and the number can be changed. Wordpress 5.x backup format will be used by default or you can pick the Wordpress 4.x format. Confirm by clicking the Export button. A folder with an exported file(s) will open once the export is complete.